One Fat Frog has long been known as the place to save your money and give you a good square deal in the food service and hospitality industry. We have also built a name in the food truck, food trailer and mobile kitchen industry. 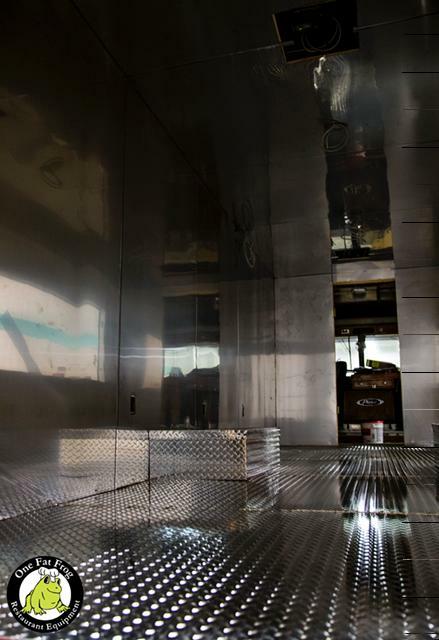 Take a look at the interior of this food truck we built. It is all stainless steel interior food truck which is an upgrade. Stainless is not necessary on every wall and therefore we will give you the option of stainless or FRP. Save money on your build where it makes sense – don’t save on your fire safety or flooring. And when do you get serious about buying a workhorse premium mobile kitchen come in. At any given time we have between five and 10 build outs going on. This allows you to talk with our food truck milk division and see various different stages of the buildout.